I want to remind you that like last year, there won't be any contest during January, so I'll see you all in February! This month the song is called You & Me & The Radio by the band Human Radio. This tune was taken from the Telefunken sessions. Have fun! As always you can download the multitrack from the website or clicking on this link. Please use the website as the main resource for the contest. Check out the Facebook page and the Facebook group if you still haven't! DO YOU WANT TO SUPPORT THIS CONTEST? Last edited by DaveKeehl; 12-26-2018 at 06:46 AM. Let’s do a killing mix! Mixing the song... so good! The drums (especially the snare) are so well recorded! I thought the guitars sounded excellent too. In general though, it's a high-level recording. Always a pleasure to work with well recorded material! Decided to postpone the mixing deadline of 1 day. I'll be accepting entries until Monday night at 11:59 PM (CET)! We can use any JS FX ? Sonic anomaly stuff or Stillwell ? I think all js effects are allowed. be sent in with your submission (In this case the Sonic Anomalie FX). Ok thanks! That makes a bunch of extra plugins! I've never heard of the Sonic Anomaly FX before. They look great! Will definitely be trying them out soon. Mr.Elwood also if you don't know. The limiter is quite nice. Voting has begun! Go listen and vote! 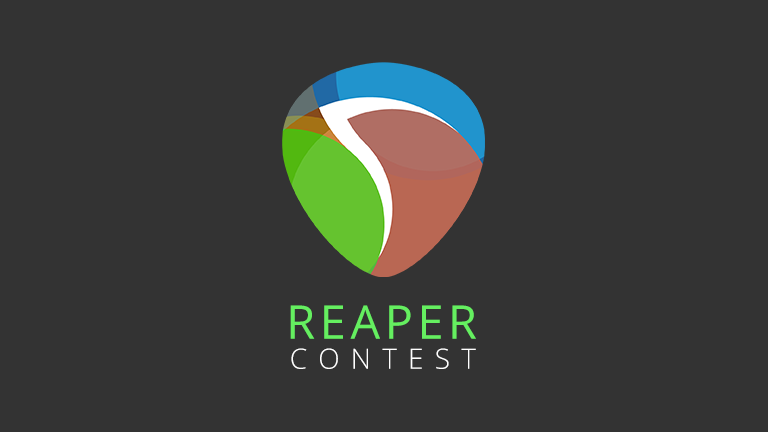 And here we are with the final results of the REAPER Contest 2018 edition! 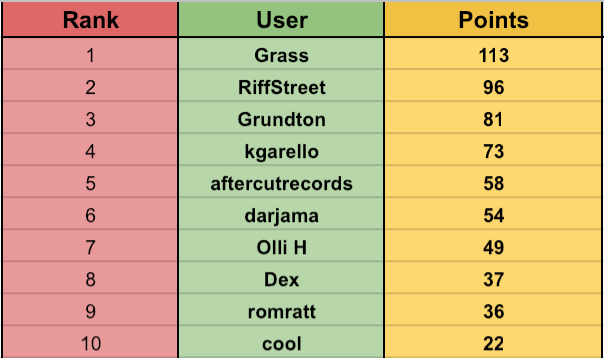 This year there was a lot of competition and rallies happening in the Top 10, but still... only one user was able to make this thread his (or her? ) kingdom. You delivered some truly great mixes Now go enjoy some well deserved rest and go work on more original songs because we want to here more! 1. The organ is a little too loud at the beginning (it sits better later in the song). At the very end of the first chorus, the line “you and me and the radio” gets drowned out – vocals need to be automated up there. The kick and snare, or maybe all the drums in general, need to come up in my opinion. The piano part near the end needs to come up. Listening to this mix, I find myself wanting to tinker with an EQ on the master track (maybe a cut in the mids somewhere and a slight boost in the highs somewhere). 2. The vocals are very up front in this mix. I’m not a fan of the L and R panning of the one guitar solo part. I assumed that they meant for that to be one seamless part but recorded two parts separately to get the best result. Not a big deal though. I feel like the bass guitar could use a boost in the high-mids or some distortion to help it cut through. The kick is cutting through really well but the snare not so much. 3. The first thing that strikes me is how dry the lead vocal is – is there no delay or reverb at all on the lead vocal? The lead vocal also might be just a little low in the mix. Left out parts of the one guitar solo? Drums sound good. Overall good and clear. 4. This mixer did a great job on the piano in particular. The piano comes through in the intro better than it does in most mixes, it sounds great during the choruses, and during the outro it sounds amazing. The piano gets buried in many of the mixes, but it sounds killer in this mix. I feel like I’m hearing the snare primarily from the overheads and not the close mic (and therefore the snare isn’t loud enough). I’m not sure how I feel about the lead vocal just before the final chorus comes in (“She grinned at me with those big green eyes and said”). It’s really cranked up there… but one could argue that it makes more sense to leave it back in the mix a bit to help the chorus hit harder. 5. Good and up-front snare sound… and I rarely think that a snare is too loud, but it might be in this mix. Hi-hat seems to be panned very far left, which I’m not a fan of. See my comment in my notes on mix #2 about the guitar solo. 7. The bottom end is very prominent in this one; I think taming it some would help make for a more balanced mix overall. Same for the reverb; I think I’m hearing excessive reverb on the organ part. Not a huge fan of the panning of the backing vocals. 8. My mix. I had limited time to mix for the contest this month but I did what I could. I don’t really hear anything that I absolutely hate… I do wish I had done a better job on the piano part during the outro (as in mix #4). Whoever voted for me, thank you. 9. The guitars are burying the lead vocal up the middle; pan them out. The backing vocals are too far back. The distortion on the lead vocal could be a cool trick to use here and there but not throughout the song. The guitar solos need to come up. The tambourine could come down. 10. The drums overall could come up (but just the highs on the kick). There’s lots of ambience in this mix – vocals, guitars… personally I would like it scaled back but that could just be me. See my comment in my notes on mix #2 about the guitar solo. The hi-hat seems to be panned to the right, which I’m not a fan of. The organ is drowning out the piano during the outro. 3. the equalization is ok, except for an excess of low frequencies, having attenuated that and raised the voice would have improved the mix in general. 5. my mix re-listening I keep the snare a little high, and maybe the equalization should have relaxed the mid frequencies. 6. Guitars sound good. voice is well eq, maybe a little less than reverb. when all the instruments are together, perhaps a kind of ball is made (perhaps because of the superimposed frequencies), the choruses a little less than reverb. 8. Well in general, the guitars are a bit high, and the sound is not to my liking, for the rest. 9. The voice is hidden in the mix, the choirs also. I like the sound of the guitar and the organ, maybe a difference in the levels of the instruments would better balance the mix and the final result. 10. Well in general, nothing is out of place. Maybe the voices a little less than reverb. and a little up the drums, the rest well, the eq is to my liking. #8	good mix, why is this mix slower than the others? all the other mixes and your judgements of the mixes give a really new pespective to me and help me to do better mixes. So thank you Dave for making this contest, i appreciate it a lot. Dang, I wish more people voted. Even so, feedback is more important to me. I thought the mixes were very good this month so most of what I'm about to write are nitpicks. 1 - A little narrow on the chorus and a little bit of frequency imbalance (too muddy, not bright enough). Bass is a little too loud and the piano often gets lost (maybe an artistic choice?). 2 - Piano's really quiet on this one too. Guitars very clear and upfront. Chorus doesn't hit hard enough. Too much verb on the backing vox. Vocal levels inconsistent in verse 2. Panning on the guitar solo doesn't work well. I like the grit on the lead vox. 3 - Hats a little loud in the first verse. Chorus hits well. Kick a little spitty ("thbbbt!"). Not sure about the backing vox panning. Drums take over a little too much right before the second chorus. Guitar solo is lacking one of the parts. 4 - Mine. I used songs from The Wallflowers album Bringing Down the Horse for reference. 5 - Very dry and quite narrow. Drums are well-processed but too loud. This is the only entry where the snare roll going into the final chorus is clearly audible so I need to give big props for that. I didn't even hear it when I was mixing it! Bass and kick very tight in this one. Like the vocal effect on "tick tock" right before the last chorus. Backing vox a little loud at the end of last chorus. I like that you cleaned up the timing on the final hit. 7 - Guitars and bass are nice in the intro. Chorus doesn't hit hard though and the panning on the backing vox is a bit much to handle. LOL @ the lalalala part. Good idea to add a delay throw to the "world explodes" falsetto part. Mix is a bit dark overall and doesn't feature much dynamic range. It feels like everyone is playing as loud as possible at all times, which is not how the actual performance was and it's a little fatiguing to listen to. 8 - I don't know what happened with this one. Did you slow it down? I like the balance of the piano and guitars during the chorus, although I bet the piano could come down 1 db or so. Also in each of the chorus backing vox phrases the third "bop!" is noticeably louder than all the others. It's like this for every phrase. Overall balance is good in this one. 9 - The frequency balance is a bit off and the mix as a whole is pretty narrow but the lead vox treatment is quite good in most parts. 10 - Too much reverb. I don't like the lead guitar parts dancing back and forth between the speakers. I think it was meant to be treated as a single take. The featuring of the organ at 4:10 was perfect, and I think you're the only one who did this.